I spent a day downtown Indianapolis to meet up with some friends. It started off with getting up before the sun rose to ride with my cousin on his way to work and to be dropped of in the circle(Monument Circle which is a circle road that goes around the Soldiers and Sailors Monument downtown Indianapolis). I spent over four hours at a Starbucks doing homework and just wasting time. It had been a not well thought out plan and spur of the moment pieced together. I was downtown without a working cellphone and all of my stuff that I had to spend the night with my aunt and uncle and then my cousins. So I had to hope that my friend had gotten all of my texts I’d sent before my phone died. However this wasn’t the case. But luckily I knew to expect my friend around noon and when I looked up I saw her standing outside looking at her phone. It was a perfect stroke of luck. We wandered around the circle, eventually popping into a comic book store. Outside on the window was a small sign “free maps inside”. We looked around and the owner/worker who was there was very helpful, before we left we asked for a map and he not only gave us a map but also showed us how to get to the restaurant we were thinking of going, letting us come behind the desk to look at the way there on google maps. He also gave us the best ways to get there to avoid semi unsafe spots. We dropped my stuff off in my friends car, which was a welcome relief. On our way to the car it started raining so we scrapped our original restaurant plan and circled back to get pizza at Giorgio’s Pizza (9 East Market Street) right next to the comic book store we’d gotten our map from. (and the Starbucks I’d spent all morning at) We had a good time catching up. We each ordered from their lunch deal which meant we got pizza, breadsticks, and a drink for less then $10. Afterwards we walked over to the Chocolate Cafe that had caught our attention. (20 North Meridian Street). The shop is broken up into segments. First it’s a chocolate shop, to buy candies and chocolate covered goodies (like pumpkin malt balls or truffles), then it breaks into a small part of the shop where you can order hot chocolates, and chocolate coffees, followed by a section for ice cream, cookies, and cake. After that is sitting space and a door that leads to a frozen yogurt shop. We tried several different flavors of ice cream before sitting down. 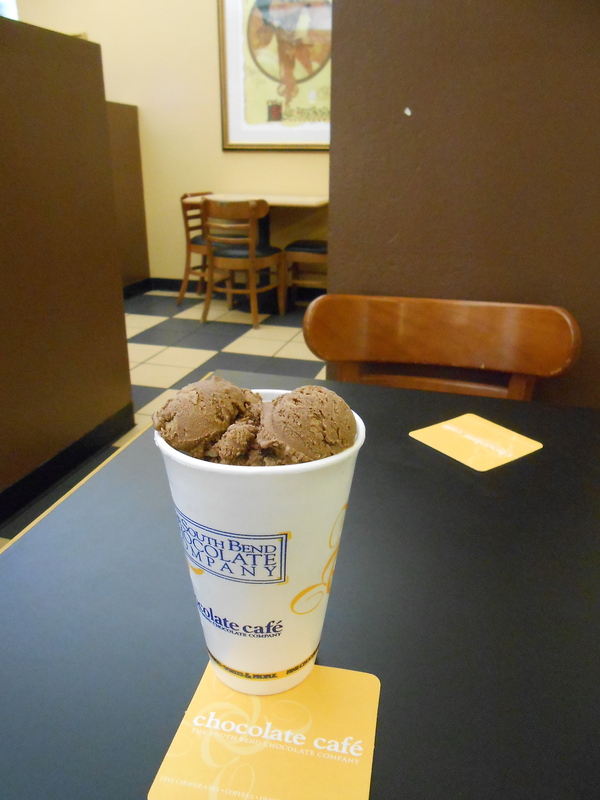 I had a scoop of chocolate malt and a scoop of chocolate and peanut butter ice cream. The shop was decorated with different chocolate-y things, like a Mucha style poster for chocolate and signed photographs from Willy Wonka and the Chocolate Factory. The main fun event for the day we decided to do while at the cafe. 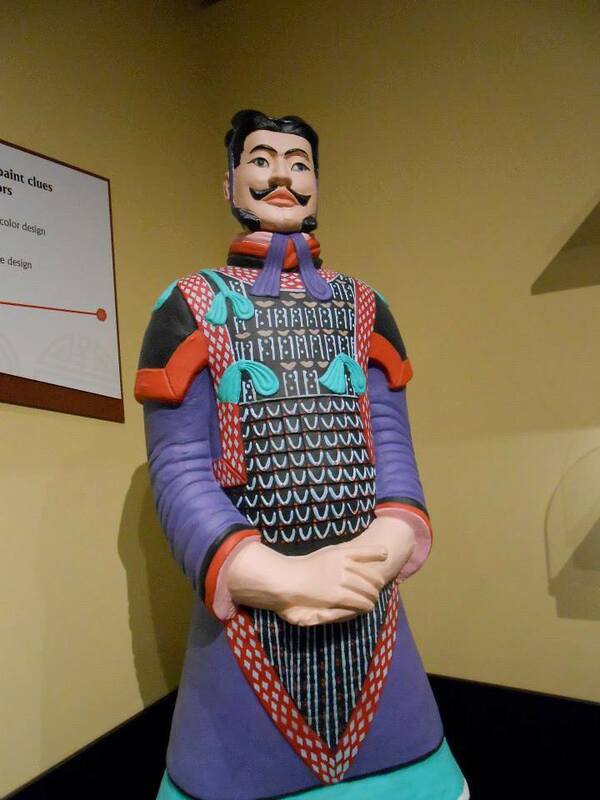 The Indianapolis Children’s Museum (3000 N Meridian St.) has on loan some of the Terra Cotta Warriors from China. 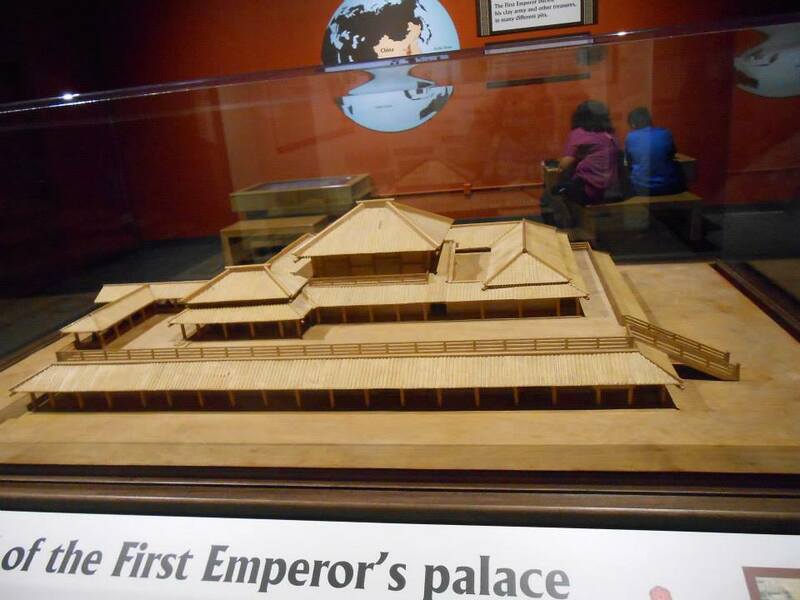 The exhibit includes over 100 items on loan from the Emperors Tombs in China. There’s an additional ticket for the Terra Cotta warriors so there’s an additional price. 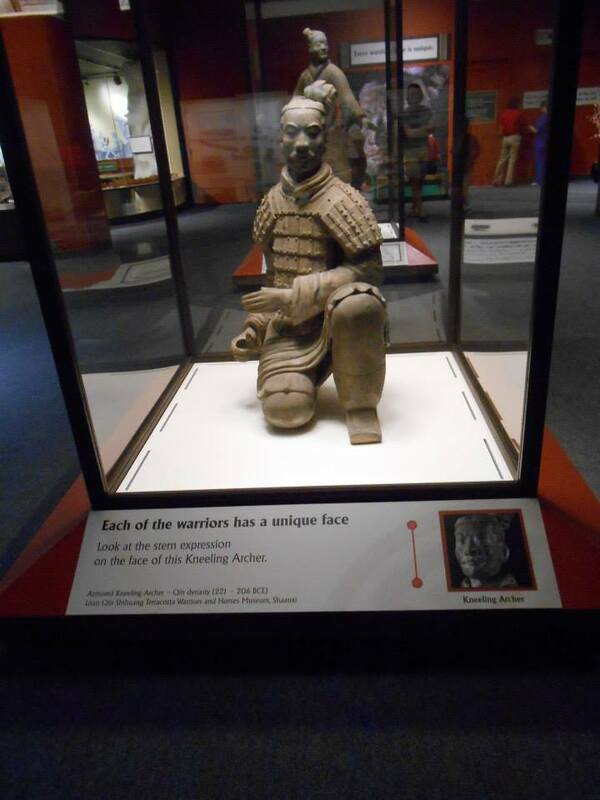 (For adults the tickets to see Terra Cotta Warrior’s are $10). When the tombs were found the ceiling above the had collapsed shattering the over 8,000 warriors, birds, horses, chariots. A mixture of scientists, archeologists and artists worked together on the puzzle of putting them all back together again and found that originally the Terra Cotta Warriors had been painted in vibrant colors. This photo is of a replica of what they thought the painted warriors originally looked like. The complex of tombs for the e=Emperor is about 5 acres and almost all of it has been explored, except one mound where they believe below the earth is a recreation of the emperor’s palace. They believe over 700,000 prisoners spent 40 years making everything. Inside each warrior is a signature that when a warrior wasn’t done quite right would be broken open to find who was responsible so they could be punished. Each warrior has a different face, and had working weaponry, such as real arrows and crossbows. We were a bit in a rush when we went to the Children’s museum, because there are specific time periods in which you can go and look at the warriors. First you watch a short film and then get to move on to look around at the exhibit. We were able to learn about how the warriors were made, found, and put back together again as well as how they were working to preserve the paint on the found warriors. We played around with putting a warrior together, took a photo with some replica’s, and made our own miniature terra cotta warriors to add to the army the museum was building. 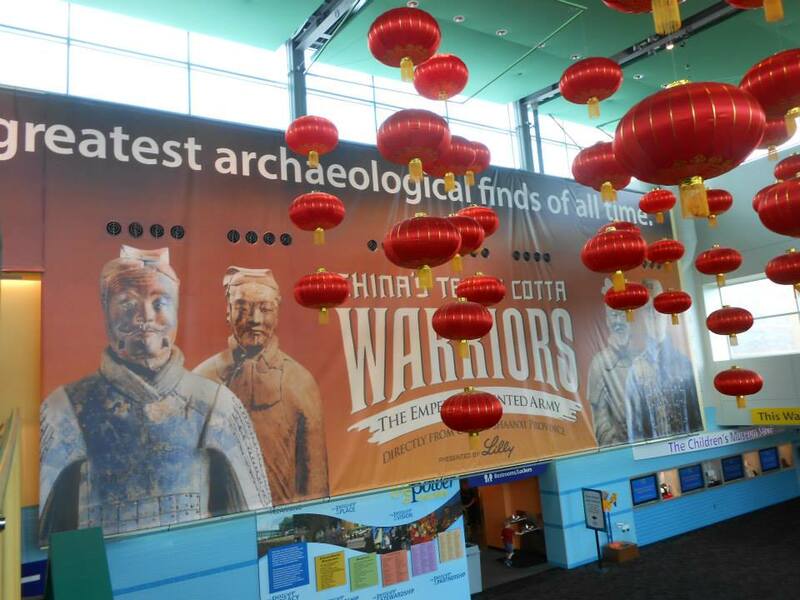 The exhibit at the Children’s Museum is the only United States destination for the Terra Cotta warriors and they will be on display until November 2nd. The children’s museum is pretty easy to spot when you get close. 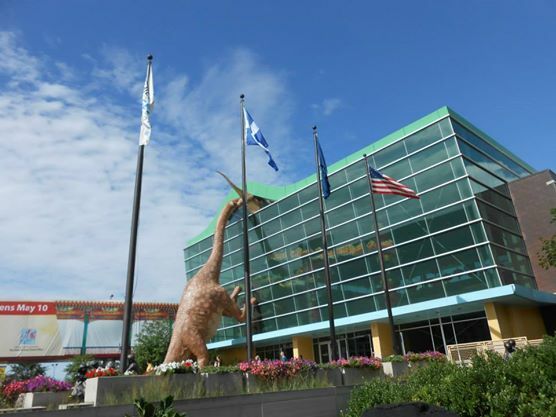 Look for the dinosaurs breaking into the building. We didn’t have a ton of time to explore the rest of the museum since it closes at five and we’d already spent most of the day downtown wandering around and hanging out. 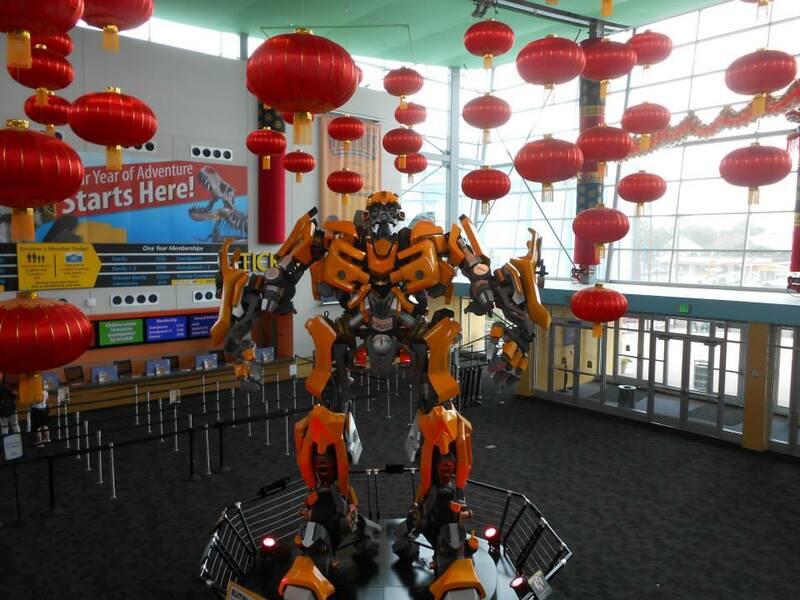 We did have enough time to take a quick look around the the sister exhibit Take Me There: China and find some random superheroes, like this life size Bumblebee from Transformers that was in the lobby. There is a lot more to do and see at the Indianapolis Children’s Museum, sadly we ran out of time.